Spokesman, Atiku Abubakar Presidential Campaign, Akin Osuntokun, has described the Buhari presidential campaign document as the "Next Level of Railway Hoaxes", saying the document is riddled with false claims and bogus promises. He said, "For instance, the Abuja-Kaduna railway line, which was 99% completed by the PDP government when Buhari arrived in May 2015, has still not been completed while they continue to lie about it. There remain outstanding works under the contract like the fencing of the right of way for which N4bn ($130m) was appropriated and spent in 2016, yet there is no fence. The fence is a key safety component of the railroad's overall physical integrity. If the fence had been completed and the right of way secured, the recent accident with cows on the right of way would not have occurred. Only an irresponsible government will continue to expose its people and their livestock to such perils while lying to them." Osuntokun warned that a derailment caused by such an incident could have serious consequences for the safety of railway passengers. The spokesman added, "The government has failed to explain what it did with the N4bn appropriated and released for this fence and why there is no fence. "On the Abuja light rail which Buhari claims to have completed, nothing could be further from the truth. The project which comprises of 6 lots has only seen the completion of lot 1A which amounting to less than 20% of the Abuja light rail system". "The APC hoax document also claims to have completed the tracks and signalling on Abuja-Itakpe-Ajaokuta-Warri line which is patently untrue. There currently exists no railway track between Abuja and Itakpe and as far as signalling is concerned, Itakpe-Ajaokuta-Warri was last reported at 32% completion. "Buhari's promise that he would complete a new railway line from Port Harcourt to Maiduguri, a distance of about 2,000 km, in the next 4 years when he has not even signed a contract for that purpose is the height of irresponsibility. They do not have the N6 trillion required to construct this line nor have they secured any loan for this railway, so how is he going to do it? By magic?" Akintokun further identified the promise to complete the coastal railway, a new railway of about 1,500 km from Lagos to Calabar, in the next 4 years as another Buhari grand deception, saying, "This was a contract that was awarded by the PDP government in 2014 and which Buhari has refused to fund in 4 years as not one shovel has hit the ground. It is now not likely that he can find the N4 trillion required for this line having frittered away so much money on vote buying in the name of this moni or that moni. "The question to ask Buhari is, if in the last 4 years, he has not been able to complete Lagos-Ibadan, a distance of only 150km, is it the 1,500 km of Lagos-Calabar that he will be able to complete in the next 4 years? 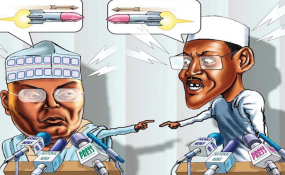 Is it the 2,000 km of Port Harcourt to Maiduguri that he will be able to construct in the same period?" If this government has only been able to raise $1.5bn loan in 4 years to build the 150 km Lagos-Ibadan railway, is it in the next 4 years that it would raise $30bn or N10 trillion and construct 3,500km of railway? "Buhari needs to come clean and tell Nigerians the truth that he does not have a credible plan nor the capacity to transform the railway. A transformation that began under the PDP but is being truncated by the Buhari government. Recall that the PDP had embarked on the Abuja-Kaduna standard gauge as well as a wholesale rehabilitation of the existing railway lines, completing the rehabilitation of the Western line from Lagos to Kano and Zaria to Kaura Namoda, Kano to Nguru, commissioning train services like the Lagos mass transit service, Kano mass transit and the Lagos-Kano service among others. The PDP government also commenced the rehabilitation of the Eastern line from Port Harcourt to Kaduna and Maiduguri and introduced services on the line pending completion of the rehabilitation before Buhari took over. In fact, the rehabilitation contracts were 85% when the Buhari government came in but he has refused to complete the contracts, leaving the track to fall into disrepair and dilapidation again. Suffice that all the train services on the Eastern line inherited by the Buhari government such as Port Harcourt to Kano, Port Harcourt to Enugu, Gombe to Kaduna have all since ceased due to Buhari's incompetence and failure to complete the 15% left on the Eastern line rehabilitation contracts. "The promise to build a new Eastern line by Buhari for N6 trillion is a total hoax with bells and whistles when he couldn't bring himself to spend a mere N13bn to complete the Eastern line rehabilitation. In the same vein, it is patently obvious after 4 years of dithering and more lies that Buhari has no idea of how to construct the Lagos to Calabar Coastal railway. "It was the PDP government that developed the railway masterplan and instituted many projects to modernize the railway including the Lagos-Kano, Abuja-Kaduna, Lagos-Ibadan, Lagos-Calabar coastal railway, completion of Warri-Ajaokuta-Itakpe, all of which the Buhari government is now appropriating and mismanaging". Fears of Foreign Interference and Intervention in Nigeria's 2019 Presidential Elections - Quo Vadis?